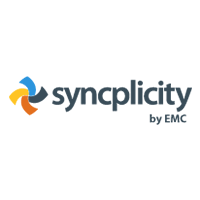 Syncplicity is file syncing system developed and sold by EMC, one of the largest enterprise storage companies in the country. 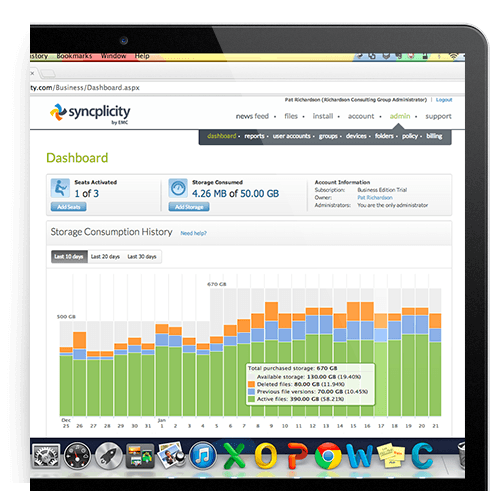 Syncplicity offers a broad range of data and storage services to thousands of clients and businesses including energy, life services, healthcare, and more. Syncplicity offers a reliable service for businesses seeking a solution for company file syncing. Syncplicity supports both Windows and Mac OS X and is compatible with all mobile devices. Once installed, automatic file synch and backup beings and there is no size on file limit or type. IT departments can monitor and control access to business data at any level, using a granular permission scheme implemented at the user, file, or device level. When Syncplicity is installed, a centralized company policy automatically reorganizes files and actively configures the settings so that the individual user does not have to. Syncplicity is used by many companies for their file syncing needs. Recently, one hedge fund with sensitive financial data turned to Syncplicity for help in securely transmitting their data between offices. They also needed a way to integrate and sync a cloud backup solution with their current data management infrastructure. With Syncplicity’s services, the hedge fund was able to implement policy controls in compliance with government and industry regulations, and solve its data issues in a matter of weeks. Learn everything you need to know about Syncplicity. Our experts will reach out to you shortly.